rather than a concrete fact. Thoughts roam where they will. in search of new horizons. If you click on the Two in Tandem logo in the side bar, eventually, with luck, you'll be able to see other people's ideas of what my glittery graphic suggested to them! So here's one on Monday instead, better late than never. For several weeks now, I've been eyeing up a four foot six 'weed' in my garden, that had materialised alongside my whirlygig line, but as it added a splash of colour with its pretty array of yellow flowerheads, I left it in peace. 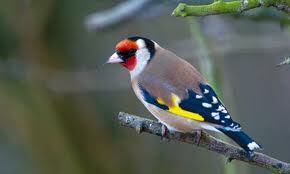 And for the past few days two goldfinches have been saying "Thank you", by coming to feast on its seeds. I had to resort to Google for this image from The Guardian, as there was no chance of my catching my own visitors unawares. I shan't be digging up the 'weed', but will leave it to flourish and possibly produce progeny in the future, in the hope it will encourage these delightful little birds to draw an 'X marks the spot' on their Good Food Guide Map. 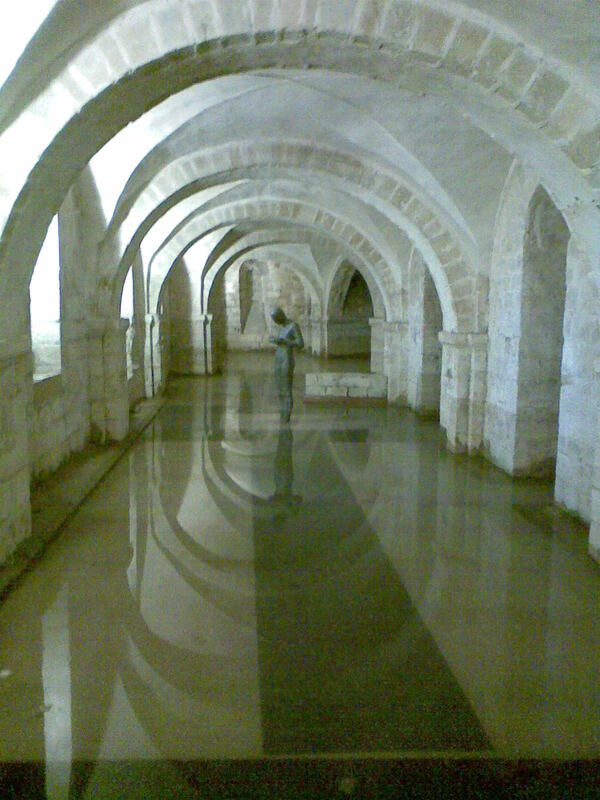 Winchester Cathedral - Flooded crypt with statue. As I wandered through some of my photo files I found this hauntingly beautiful picture that my No. 1 Son took a year or two back, after melting snow had caused an unusual problem. It speaks for itself. See more photographic delights on Sepia Saturday, thanks to Alan and Kat. And here's my number one attempt at a recognisable painting, using the Bamboo Tablet and Pen I mentioned a while back. 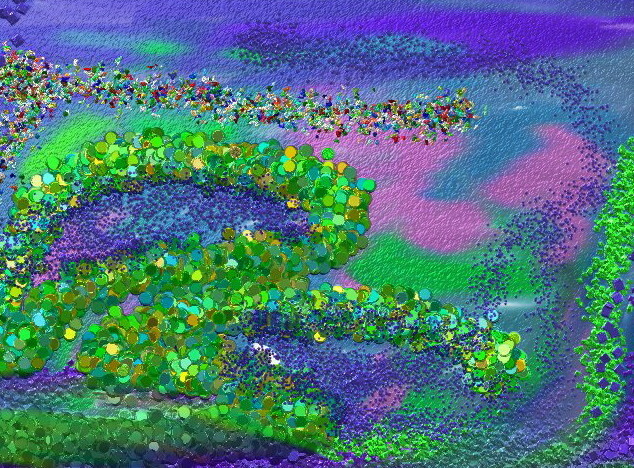 I'm beginning to understand some of its capabilities, but I can tell, there's still a long way to go! Over on Alias Jinksy today is another example of how imaginary 'brushstrokes' can be made to look 'real' by computer wizardry. If you are one of those people who gets the urge to write when confronted by a collection of colours, please feel free to copy the graphic onto your blog, and join in. You'll find a Linky List so you can add your name and blogpost URL once you've put pen to paper, or fingers to keyboard. Linky will make it easy for nosey parkers to visit and see what you've done later in the week! Hehehe! However, that was the only boring part. On the way home, I called into Wordsouth to drip dry for a bit, while I drank a cup of their green tea with orange and lotus flower. It's where I attend various writing classes and events, and as it serves as a tiny café, it was an ideal place to drop in. I spent a happy hour or so in the company of its owner, plus two literary gentlemen who were discussing Kipling's 'Rewards and Fairies'. One of them said there was a secret message in the book, if you could find the key to unlock it... I can't wait to get a copy and start looking. Who knows what I may find? 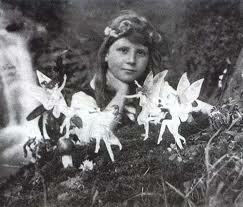 old illustration of the Cottingley Fairies to Sepia Saturday? 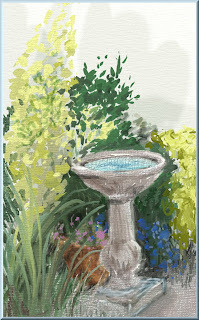 Thanks, Alan and Kat for thinking up the blog.... You are obviously both good fairies!. I've Had An Attack Of The Borrowers! If you've never read the book by Mary Norton, you'll wonder what on Earth I'm talking about... But if you have, you'll understand how puzzled I am that my Borrowers have purloined the tiny, USB cable that allows me to load my camera's photo's onto my computer. I wouldn't be at all surprised to learn that Arrietty or Pod have decided to become Bloggers, and set themselves up with a micro computer that needed my USB, which since Monday, has totally disappeared from the Aladdin's Cave I laughingly call My Desk. Until a hastily purchased replacement arrives, Napple Notes are liable to remain unillustrated... Unless I pinch yet another picture from my long suffering Bro's collection? What a good idea! No sooner said than done. Thanks, Bro! 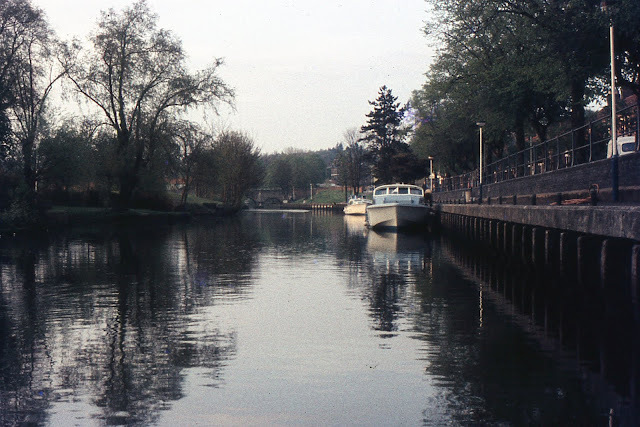 This was taken during a boating holiday on the Norfolk Broads in 1973... Happy Days! And it's the perfect opportunity to link another non-sepia photo to Sepia Saturday as well. Thanks Alan and Kat! Aromas link arms: tanned leather with fish glue, wood shavings with sawdust: turpentine with oil paints. Immediately memory takes me back to my Uncle Fred’s shed, with its open sliding door emitting exciting smells that drew me in as though I had a rope tied to a ring in my nose like a prize bull being lead round a show ring. His littered work benches, along with metal lasts and vices of varying sizes, held mysterious boxes, tins, jars, bottles and canisters, from which he would extract some item he needed for the next stage of whichever project he was working on. He had at some time made a square-topped wooden stool, which he used to let me perch on, as a child, so keeping me at a safe distance from his lathe, or sharp knives, while still letting me part-share in his creative processes. His large hands with their thick, square topped fingers, could work with the utmost delicacy as they shaped the new leather sole to the well-worn footwear of friends or family for whom he played cobbler. 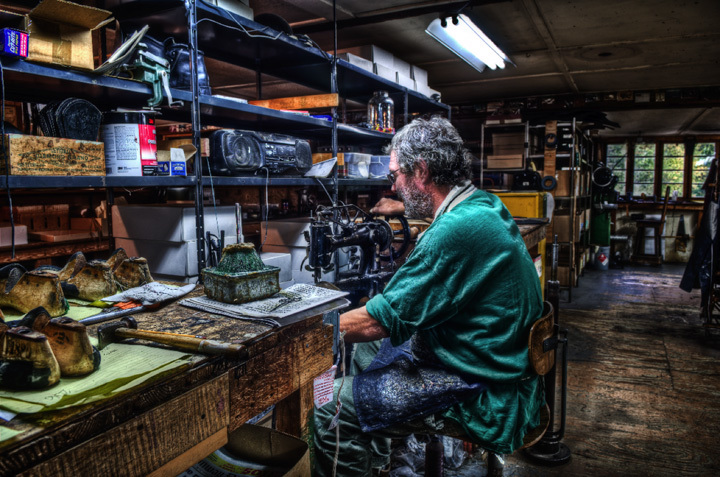 I would watch every stage avidly, and marvel at the final polishing of the edges on his noisy, whirring machine. One push of the starter button, and the lathe grumbled into life. As he used the various discs of the sander, polisher or brush, the pitch of the motor sang its own switch-back song, loud enough to drown out any childish questions I might ask. Nunc, as I called him, almost always had a cigarette between his lips, which waggled up and down as he talked and sent wreaths of smoke swirling around his head. It made him screw his eyes up, and the action folded the skin of his face into wrinkles. I was reminded of Nunc today because of this photo on the right by Rob Hanson, to whom I say 'Thanks for the memory!"" 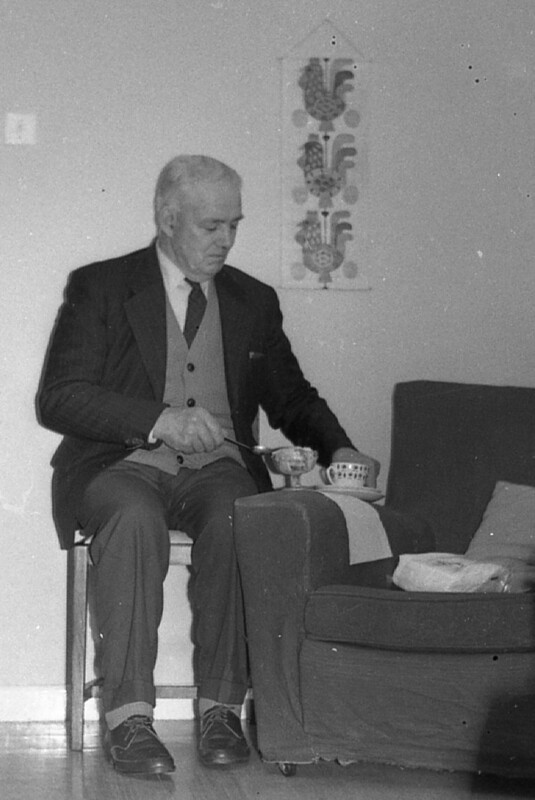 And on the left, is my Uncle Fred, dressed for company! Now, I think I shall I shall put this in as a late entry for Sepia Saturday.